Increasing demand for Israeli, Turkish and Persian foods by consumers has been witnessed since recent times. This has given an impetus to the consumption of tahini, typically as a dip or sauce in many dishes such as salads, falafel, soups and baba ghanoush. In addition, chefs are using tahini in various dressings such as balsamic and ranch dressings. This factor is expected to support the growth in consumption of tahini during the forecast period. Fact.MR’s analysis on tahini market has revealed that the sale of tahini is estimated to exceed US$ 2300 Mn by the end of the year of assessment (2026). Moreover, the global tahini market, according to Fact.MR, is projected to expand at a steady volume CAGR of 4.7% throughout the period of assessment, 2017-2026. 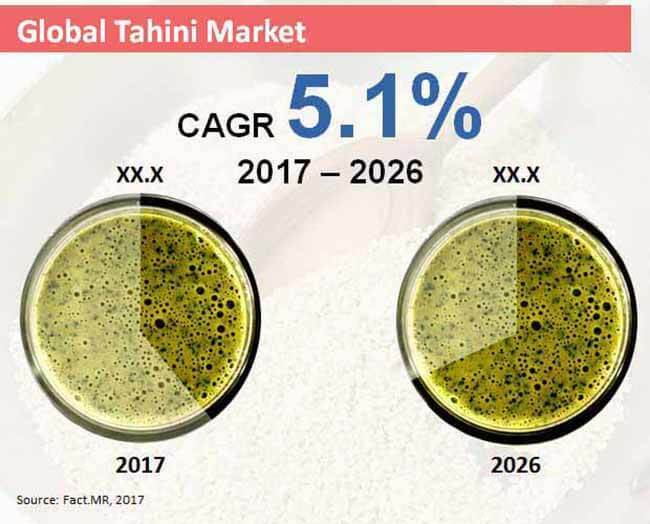 The growth of global tahini market is significantly fuelled by increasing demand for healthy foods, the growing trend of in-house cooking and substantial use of tahini sauce or paste by eateries in different food items. Key players profiled in the global tahini market research report include Mounir Bissat Factories, Sunshine International Foods, Inc., El Rashidi El Mizan and Halwani Bros. Co. Rising popularity of Middle Eastern cuisines coupled with growing demand for traditional Arabic flavors and tahini products, in countries such as China, the United States, Canada, Mexico, Brazil, India and Spain is expected to spur the demand for tahini, which in turn is poised to contribute to the growth of the global tahini market in the coming years. For example, food products such as hummus and tahini pastes are gaining significant popularity in which tahini is used as the base ingredient. In addition, tahini is steadily replacing butter and is used as a side dish and garnish in many restaurants in Middle Eastern countries. Moreover, tahini dips and sauces are widely served along with shawarma, kebabs and sandwiches with a view to provide authentic Arabic taste. This is expected to fuel the consumption of tahini thus pushing its sales during the period of forecast.